Amsterdam - Cristiano Ronaldo marked his return from injury with a precious away goal as Juventus drew 1-1 with an excellent Ajax in the first leg of their Champions League quarter-final in Amsterdam on Wednesday. 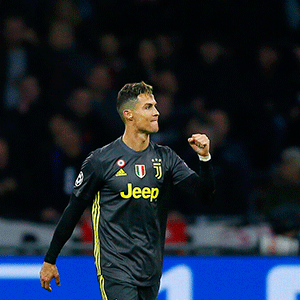 Ronaldo subdued the 50 000 home fans in the Johan Cruyff Arena when he headed Juventus in front on the stroke of half-time to take his record goal tally in the competition to 125. However, it is Juventus - for whom substitute Douglas Costa struck a post late on - who hold the upper hand heading into next Tuesday's return in Turin, with the winners of this tie facing Manchester City or Tottenham Hotspur in the last four. Ronaldo was back for his first appearance since suffering a thigh injury playing for Portugal last month - it was his first game for Juventus since netting the hat-trick that dumped out Atletico Madrid in the last 16. Frenkie de Jong is leaving for Barcelona, and the 21-year-old's eagerness to get on the ball and start moves here underlined why the Catalans were prepared to pay an initial €75 million in January to secure his signature. Andre Onana got a touch, but could not deny Ronaldo his 25th of the season - he has now scored six Champions League goals at the Johan Cruyff Arena, as many as ex-Ajax star Zlatan Ibrahimovic.